Families separate every day. When your family finds itself divided by separation or divorce, statistics don’t matter. Parents work to make sense of a new way of life, and they worry about their children. Building a strong co-parenting relationship helps build a foundation for a lifelong, cooperative partnership. Ask yourself whether you expect your separation to be temporary or a stop-gap on the way to a divorce. If you are fairly certain — or absolutely certain — you’re looking at a divorce, get your financial situation in order, if possible. Talk to your partner, if you’re communicating amicably, about how and when money and possessions will be divided. Many people struggle to co-parent if they’re arguing about money. Katie Hurley, LCSW shared her thoughts about how to navigate co-parenting. In addition to working with children as a psychotherapist, Hurley writes about how parents can strengthen their relationships with their children. Her book, The Happy Kid Handbook, focuses on finding happiness for your unique, individual child. “Navigating co-parenting requires patience, empathy, and tons of compassion. This can be difficult for parents during the early phases of separation and divorce. All families are different, so it’s practically impossible to give one-size-fits-all coparenting advice, but parents can ease the emotional stress on the kids by using direct communication (never use the kids to send messages back and forth) and working together to make sure the kids have relationships with each parent. Decide on living arrangements as soon as possible. Ideally, you and your partner would work out the arrangements before telling your children about the separation. You don’t need to work out when the kids will be with each parent, but it helps to know who will be living where. Will one parent stay in the family home while the other leaves? Will both parents find somewhere new to live? Will the kids stay at the house, with the co-parents rotating between the house and a new residence? Kids might find it helpful if you allow them to help make decisions about any new spaces they’ll share. It might be the perfect time to transition from a little kid to big kid room or to paint walls a fun color you previously nixed. Combining elements from the family home with new things in a new space helps kids feel like they’re really at home in both locations. A professional will help co-parents figure out a schedule if necessary, whether you’re planning on using a mediator or going to court. However, with a somewhat amicable separation, co-parents might be able to work together to figure out a possession schedule on their own. If you’re working on your own, take into account the work schedules of both parents, school or child care hours and locations, and when and where possession will change. AppClose offers a wide range of schedules preloaded into the co-parenting app if you’re unsure about what options might work best for your family. After figuring out the custody scheduling, staying flexible helps facilitate a strong co-parenting relationship. At different times, both parents will need a little extra time with the kids for a weekend away or a little extra time away from the kids to finish a huge project at work. Remember, saying no to your ex-spouse trickles down to your children. Making adjustments to the possession schedule in a proactive, cooperative way lets kids know they’re never an inconvenience. Parents can be tempted to make sure the possession schedule feels almost exactly balanced. A joint custody schedule doesn’t have to mean kids are with each parent exactly the same amount of minutes each week. Fairness beats equality when it comes to your kids’ feelings. For instance, one parent might coach a Little League team. It makes sense for that parent to continue to drive the child to practice, even if the time doesn’t technically fall into their custodial time. When you’re first adjusting to a joint custody schedule, you might find yourself tempted to linger. Often, though, lengthening goodbyes ups anxiety — in both kids and the leaving co-parent — rather than lessening it. The sooner you can normalize the transition between households, the sooner your kids will feel the movement is natural. Extended kisses and hugs or overwrought emotion makes the transition seem like a vacation instead of a scheduled part of life. Children don’t need to know the details of why their parents are separating. Affairs, financial conflicts, or any other complicated reasons should be kept between adults — especially at the beginning of the separation. Kids need to feel loved and supported by both parents, and hearing negative opinions about either parent can be both confusing and devastating. Co-parenting doesn’t mean resolving the conflicts that lead to the dissolution of the marriage or long-term partnership. Keeping the goal in mind — a supportive and smooth transition for the kids — helps separate adult issues from co-parenting issues. Sometimes, even the most dedicated parents struggle to find common ground with their former spouse. Attempting to communicate fully with an ex-spouse can cause conflict that trickles down to the kids without resolution. In that case, parallel parenting might be necessary, then parents can later work toward a cooperative co-parenting arrangement. Parallel parenting relies on parents disengaging from each other instead of cooperating. 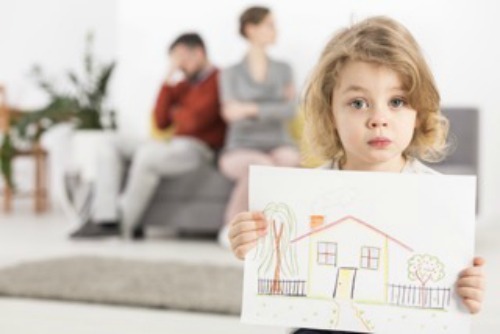 With limited contact and certain parameters in place, each parent concentrates on their relationship with the children instead of worrying about a cooperative relationship with an ex-spouse. No matter how you recharge your emotional and physical energy, be sure to do it consistently. Self-care looks different to everyone, but all parents need some time to themselves to help navigate a separation, divorce, and co-parenting. Something as simple as getting a good night’s sleep can help, but it can also be elusive when you’re feeling stressed. Yoga and meditation might help some people, while reading, running, or a little extra chocolate helps others. Taking time for yourself shouldn’t make you feel selfish. Your patience with your children — and your ex-spouse, to be honest — feels the thinnest when you’re tired and worn down. Taking care of yourself lets you take better care of your kids, which is the ultimate goal. While you shouldn’t rehash adult conflict with the kids, pretending the divorce didn’t happen is wrong, too. All of your lives are changing and rearranging themselves into a new normal. Acting as though changes aren’t ongoing does a disservice to your kids — and to you. Let them know you’re still figuring out the details, too. Seeing your missteps lets them feel more comfortable making their own. Learning how to live in a new environment, with different rules won’t always run smoothly. No matter how carefully you and your ex attempt to smoothly transition, the very act of such a huge change means everyone will make mistakes and everyone will feel hurt at various times. Acknowledging those feelings normalizes them and allows for conversation that helps work through the bumps in the road. Your co-parent shines in certain aspects of parenting, just like you do. Just because you don’t easily shift back and forth in parenting roles the way you did when you were under one roof, don’t discount those strengths. That doesn’t mean you can’t parent outside of your comfort zone, because doing that can only help you grow as a parent. Still, if your ex adores the science fair and you’d prefer to oversee their final English paper, there’s nothing wrong with reminding your child they can call their other parent for input. Verbalizing those strengths shows your kids you appreciate your ex-spouse as a parent. That appreciation also lets them know you and your ex are still parenting together, even if you’re not in the same house. Though certain rules may change from household to household — one parent may allow dinner on the couch while another relaxes bedtime routines — but keeping a united front about big issues offers consistency and stability kids need. That can ward off instances where kids try to play parents off each other. And even the best, most well-adjusted kids will eventually try that! Proactively seek out a family therapist. Talking to a professional needn’t be a reaction to a troubling situation, instead you can be proactive about talking out your concerns. If you wait until you or your kids are struggling to find a therapist, kids might think they’re doing something wrong. Addressing a therapist as another tool in the transition process highlights how speaking with a professional strengthens personal resilience instead of fixing a problem. Both co-parents and children can benefit from therapy sessions. Being in the presence of an objective third party means open discussion without the guilt of worrying about how your words affect others. You can go as a family, too, but individual therapy sessions can help each family member feel heard and valued during a tough transition. Reach out to the people you love. You know the ones: they love you, love your kids, and want to help. Touch base with friends. You have the chance to rekindle relationships that may have faltered a little while you were stressed by your marriage. You can ask for small or large favors: helping with pickups or carpooling, a dinner out, or even babysitting. 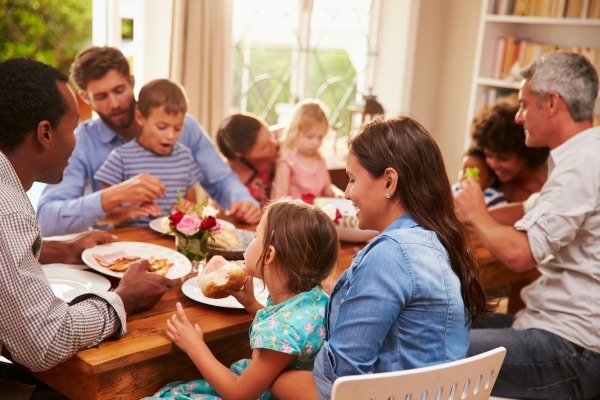 Though it can be difficult to find positives during the transition to two households, strengthening relationships with other family members can be one. Grandparents and close aunts and uncles, especially ones who live nearby, can offer a touchstone for kids who feel like so much is changing. If grandparents are out of state and can’t physically help with the transition, arrange phone calls or Skype sessions. That communication gives kids a sense of normalcy — plus they’ll have another set of ears to listen to their concerns. Don’t be afraid to seek out other resources for parenting help. Think about how you learn and how your children learn. Some families do best reading about the changes happening in a family, others prefer reaching out to a group of families also navigating separation. Even a new extracurricular activity can be a resource. Observe your kids and consider what they need. Martial arts can build confidence and music lessons can help with concentration. No, not that one! We mean the other one kids love to say: boring. When you aren’t with your kids all the time, you can fall into the habit of adding special things to your day. Maybe you find yourself stopping for ice cream more or letting them stay up a little past their bedtime the first night they’re home. Little concessions seem harmless, but be careful as to whether you’re legitimately OK with those concessions. If you’re breaking your own rules and expectations just to be seen as the fun parent, you’re ultimately doing a disservice to your kids — and the co-parenting relationship. Boring equals stability, and stability and those “boring” moments are the ones that make up normal life. Find fun in the normal parts of your day: making a meal together, attempting a cartwheel when your child talks about gymnastics, or reading a funny book together. Until “first” milestones occur, it’s a little impossible to know how you or the kids will react to them. First birthdays, first first days of school, and first visits from the Tooth Fairy all feel a little different in a new home or when you have to hear about them over the phone instead of in person. Follow your kids’ lead during these moments. Let them be excited if they’re with your co-parent. Let them feel a little sad if they’re with you and miss their other parent. Fostering a close relationship with both parents can only help your kids, even if it stings a little for you. Eventually that sting will remind you of how much your child is loved by both their parents. Setting up regular dates with someone you’ve divorced seems counterintuitive, but family meetings bolster co-parenting relationships. Sitting down with the whole family reinforces that the family is still intact in terms of parent-child relationships. Presenting a united parenting front reminds kids they won’t be able to divide and conquer — at least not about the big issues. At a certain point, it might be helpful to meet without the kids. The meetings can start in a necessary setting, like parent-teacher conferences. Touching base about common rules and expectations can be ironed out in person, sometimes more easily than through other forms of communication. Co-parents don’t need to be friends, exactly, but in-person meetings are bound to happen, and scheduling time to chat over coffee can make it less awkward when you’re sitting next to each other at the year-end musical program at school. Holiday traditions weave themselves into the fabric of families. Co-parents sometimes get caught up in holiday excitement and forget another person used to be a part of those traditions. In order to minimize hurt feelings, discuss holidays long before they appear on the calendar. It’s tempting, especially during the first year, to try to keep things exactly as they were when everyone lived in one home. Unfortunately, that doesn’t always work out as planned. Ask your kids about their favorite traditions, and talk to your ex-spouse about their favorites, too. Once you have an idea of what things are most important to whom, discuss how to deal with those events. Be honest with yourself about how much togetherness you can take during the holidays. Maybe you can catch fireworks as a family during the 4th of July but have separate celebrations on Christmas morning. Like the possession schedule, be flexible. At some point you may completely split holidays between households, but you don’t have to finalize those details at the beginning of the separation. Make a little magic by starting new traditions just with your children. You don’t have to start with something major or anything that overshadows a tradition you shared as a family. Maybe prepare a special dinner on the eve of a holiday or watch the same movie each year on the night before the first day of school. Small moments grow into meaningful ones. Respect established family traditions, but look at new traditions as an opportunity to move forward with hope.